The party don’t start till Hannah Tinti (The Good Thief) walks in. 6:30, Parnassus, Nashville, tonight. After years spent living on the run, Samuel Hawley moves with his teenage daughter Loo to Olympus, Massachusetts. There, in his late wife’s hometown, Hawley finds work as a fisherman, while Loo struggles to fit in at school and grows curious about her mother’s mysterious death. Haunting them both are twelve scars Hawley carries on his body, from twelve bullets in his criminal past – a past that eventually spills over into his daughter’s present, until together they must face a reckoning yet to come. This father-daughter epic weaves back and forth through time and across America, from Alaska to the Adirondacks. Both a coming-of-age novel and a literary thriller, The Twelve Lives of Samuel Hawley explores what it means to be a hero, and the cost we pay to protect the people we love most. Tinti’s work proves there’s still a way to write fiction about adolescents with an adult audience in mind. The Good Thief, her 2008 debut, takes a premise that sounds like a cross between Twain and Dickens—a one-armed orphan who falls in with a gang of grave-robbers—and turns it into a meditation on loyalty and identity. 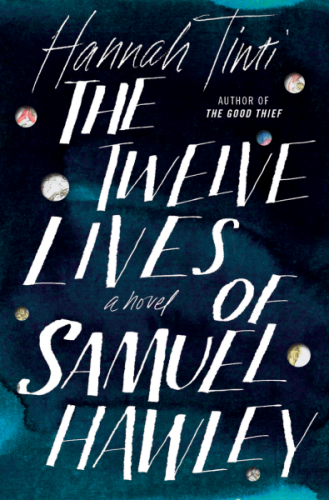 With The Twelve Lives of Samuel Hawley, she delves more deeply into the psyche of a teenage character, but the traumatic events Loo confronts should keep this book from being shelved anywhere near the YA section. Her short story collection, Animal Crackers, has sold in sixteen countries and was a runner-up for the PEN/Hemingway award. Her best-selling novel, The Good Thief, is a New York Times Notable Book of the Year, recipient of the American Library Association’s Alex Award, and winner of the The Center for Fiction’s First Novel Prize. Her new novel, The Twelve Lives of Samuel Hawley, has been optioned by director Matt Reeves/6th & Idaho, producer Michael Costigan/Cota Films & Endemol Shine. Hannah has worked at bookstores, magazines, publishing houses, and literary agencies. In 2002 she co-founded the award-winning magazine One Story and for 14 years was acting Editor in Chief. She has taught writing at New York University’s Graduate Creative Writing Program, Columbia University’s MFA program, CUNY, and at the Museum of Natural History in New York City. She grew up in Salem, Massachusetts and lives in Brooklyn, New York (where she was recently named one of the 100 Most Influential People in Brooklyn Culture). You can follow her @hannahtinti.